she can quilt: It's here!!! Isn't that the best box? The APQS folks are great and the Millenium long arm has arrived. I'm late for work, and I have been reading the 80+ page assembly manual, but my day job has my attention for the next couple of days. After that the assembly begins. 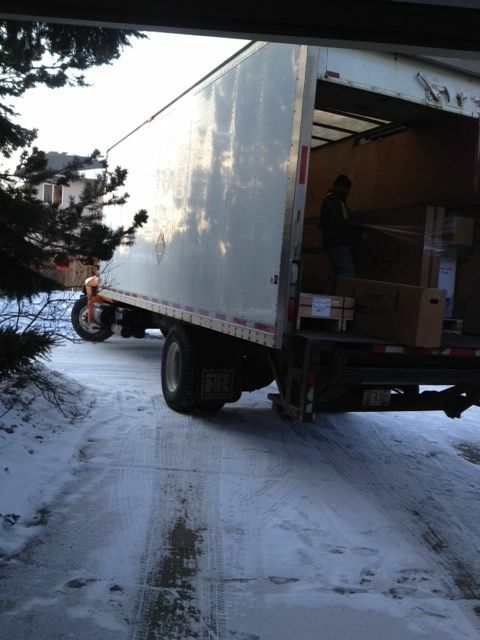 The truck was as wide as my street, and it was very cold so unloading was fast to the garage. And look, the actual machine comes with a big red bow on top. Seriously. I have to run off to work, but if you haven't yet entered my giveaway from yesterday, what are you waiting for, it's Kate Spain after all. The text on the box is great! I’m so excited for you! Pretty exciting stuff! Can't believe that bow! Yay for your beautiful and fun delivery! oh, how very exciting. so looking forward to seeing all the amazing quilting you'll do with this machine. Couldn't be more excited if it was in my driveway! very COOL!!!! Seriously exciting! Love the way they package it. Love that box. I think they have their recipients down to a T! You are one lucky women. Happy birthday by the way. I know what you are feeling! When my millennium arrived, I was over the moon! Now me and Pete are the best of friends, even after 8 years. Oh what fun!! I was beside myself when I got my Tiara....but a large long arm.... congrats Leanne!!! That box is super fun! The bow is like cherry on top. Congrats and enjoy! Now there's a company that knows its customers well! Roll on Thursday so you can start building it! OMG - that is hilarious and perfect. I will not lie, I am super jealous. I've been scheming - mean planning - how to get my hands on one of those. I'd love a review as you get used to your new baby. Congrats!! Awesome! I love companies that add those special little touches! 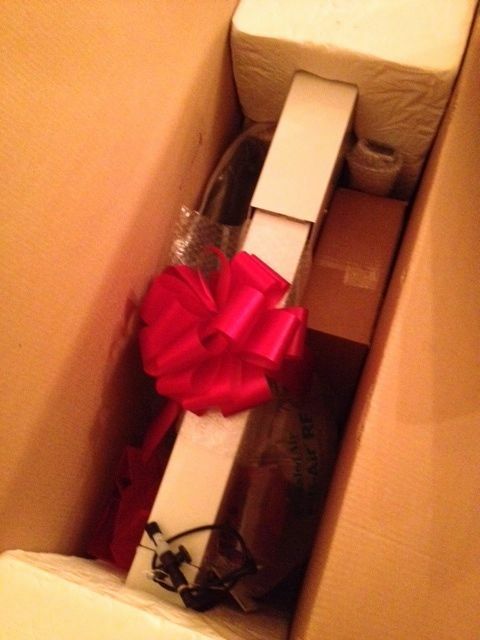 love the box and the ribbon, but the contents will be even better! Day jobs ... They sure get in the way of quilting. Looking forward to hearing the story unfold. Congratulations- very exciting. Did you do a happy dance? Ooh -- maybe a truck with a great treat inside will pull up to my house in the future too. What a fun box.....even more fun is what's inside!!!!!! So exciting :) Enjoy the happiness! EEEEKKKK!!! Can you hear me cheering from across the sea? I'm delighted for you. They really did a fab job with packaging, didn't they? Woo hoo! Oh that is the best customer service!!! Now that is awesome packaging! What a lovely sight to behold. Let's see, I guess good things do come with giant red bows on them. Congratulations and Happy Birthday! How exciting and exhilarating! You already do beautiful work, I can't wait to see what blossoms from your long arm!